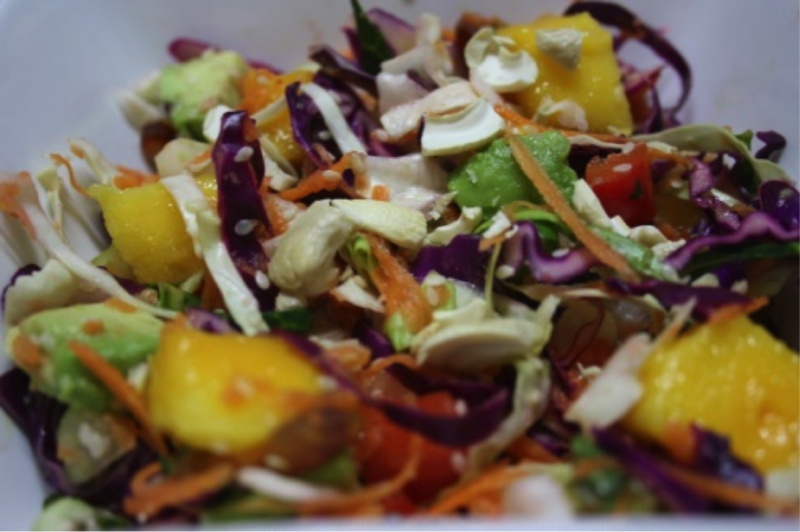 In a medium bowl, place the finely shredded cabbages, grated carrots, diced red capsicum, diced celery and shredded coconut. Add to them the pineapple cut into squares and the avocado, and mix through. In a separate bowl or small jug, blend together the lime juice, ginger, chilli, vinegar, sesame seeds, coriander, Himalayan salt and dates. Pour the dressing over the salad and sprinkle with a few crushed cashews or almonds to garnish. *the raisins can be added for extra sweetness, but salad works well without them.